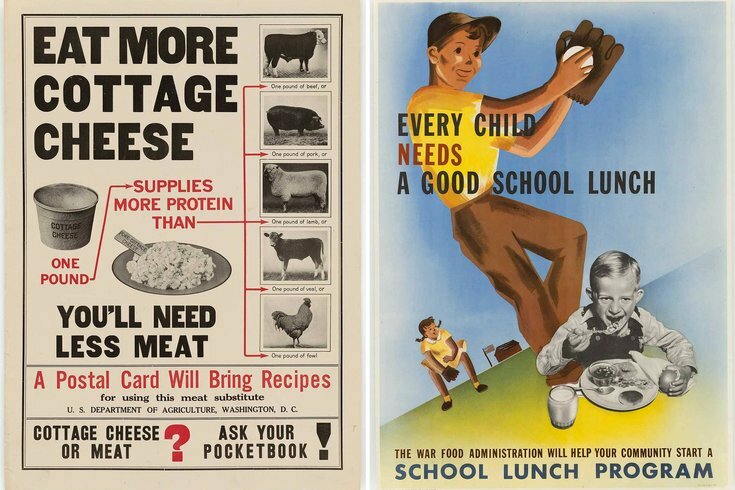 Left, a United States Food Administration poster, circa 1918; right, a War Food Administration poster, 1944. The National Constitution Center is bringing up a new exhibit on food and diets in America. "What's Cooking, Uncle Sam" opens Friday, Oct. 9, and will remain open through Sunday, Jan. 3. The exhibit explores the effect the U. S. government has on American eating habits. On loan from the National Archives Records Administration in Washington, D.C., the exhibit discusses how the government's efforts to control what Americans eat has led to great successes and complete failures. Taking guests through the concepts of Farm, Factory, Kitchen and Table and how they affect food in this country, NCC will be giving the Philadelphia area a great look into this touring event. The Farm section explores how the government affects what the country's farms produce. Information about industrialization of the food supply can be found in the Factory section, while information on nutrition and eating habits is found in the Kitchen section. To conclude, the Table section discusses meals had by presidents, soldiers and schoolchildren. Artifacts featured in the exhibit include Rosalynn Carter’s menus for State dinners, a 1931 “Signs of Good Nutrition” poster and Upton Sinclair’s letter to Theodore Roosevelt on the hazards of the meatpacking industry.